What's a Screen Shot and How Do I Make One? - Ask Leo! What’s a Screen Shot and How Do I Make One? A picture is worth a thousand words, and a screenshot - an image of your computer screen, saved as a picture - can eliminate a lot of frustration when trying to describe to someone what you're seeing on your computer. A screen shot, screenshot, or screen capture is a way to “take a picture” of your computer screen (or a portion thereof). Well, let’s say you’re trying to explain a computer problem to a technical friend of yours, and you’re trying to describe what you see on the screen — the dialogs, buttons, messages, whatever. You’re not sure of the terms to use, and your friend is having a difficult time understanding your description. You know what they say: “A picture is worth a thousand words.” And it can go a long way to eliminating miscommunication. Let’s take a picture of your screen you can email to your friend. 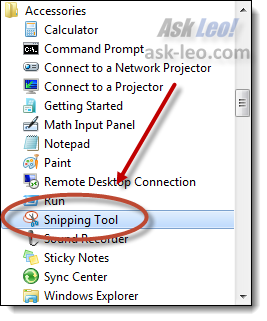 The Windows utility that allows us to take screenshots is called the “Snipping Tool”. Click on the Start button and start typing “snip”. One of the first search results will be the Snipping Tool. Click on Snipping Tool to run it. The tool has several modes, including Full-screen Snip (a picture of your entire computer screen), Window Snip (a picture of a specific window you designate), Rectangular Snip (a picture of an arbitrary rectangular area on the screen), or Free-form Snip (a picture of an arbitrary shape you draw on the screen). In the example below, I’ve selected Window Snip. Next, click on New to begin the Snip. The screen dims until I click on the window I want to capture. The Snipping Tool takes the picture and opens that picture up in its editor. In the editor, you can make annotations and mark-ups to the image before saving it to your hard disk as an image file. The Snipping Tool supports many different image formats, but .png or .jpg are probably the most common formats used for simple screenshots. The Snipping Tool will likely be the only result. Ever wonder what the PrtScn key on your keyboard is for? A long time ago, it did what you might think: push it, and your printer printed an image of whatever was on your screen. Today, however, when you press PrtScn, an image of your entire screen is placed on your clipboard. Now, rather than printing it, you can do something with it. First, we need to place it in a file. After you’ve pressed PrtScn, fire up your favorite image editor, or use the Paint program that comes with Windows XP (by pressing Start, All Programs, Accessories, and then Paint). Now in Paint (or your equivalent), hit Edit, Paste, and you should now have an image of your screen within the image editing program. Now, save this image to a file. Typically, that includes clicking File, Save As… and selecting either a .jpg or .png file format. PrtScn takes a picture of the entire current screen. ALT+PrtScn takes a picture of the currently active window only. 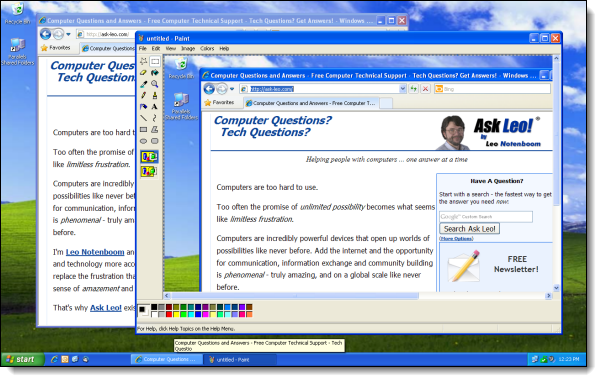 The PrtScn technique works in all versions of Windows, but the Snipping tool is more convenient. Macintoshes have screen-shot capability as well. Check out How to take a screenshot out at Mac Help For Mom. By default, I don’t allow attachments to be submitted with questions. This is mostly for my safety, as someone could easily attach malware. However, screenshots can be a very helpful resource when diagnosing problems. Should the need arise, we’ll make arrangements to get one to me. The Snipping tool, or the paste-into-Paint method, provides a basic, yet powerful, approach to getting screen captures. They’re free, and included with every copy of Windows. Of course, if you have Windows Vista or later, the Snipping Tool is very useful. When run, Snagit replaces the PrtScn functionality with its own. It allows for full screen, partial screen, and even full scrolling-window capture, along with a number of capture-time options. It also comes with a fairly powerful image editor that allows me to quickly add call-outs, arrows, and the fancy “torn edge” effect I use in many of my screenshots, including a couple of those shown above. Most folks don’t need an additional screen capture utility, particularly if your version of Windows includes the Snipping Tool. That being said, if you take screenshots regularly (as I do), a more powerful tool with more options both in capture and annotation might well be a valuable addition, and Snagit is an excellent choice. Hopefully, you can see the value of screenshots by now. You’re presented with a complex situation or a huge, long error message that you don’t want to re-type, and just wish you could show someone. Run the Snipping Tool or press PrtScn, and you’re on your way to creating an image of the screen, with everything exactly as you see it. 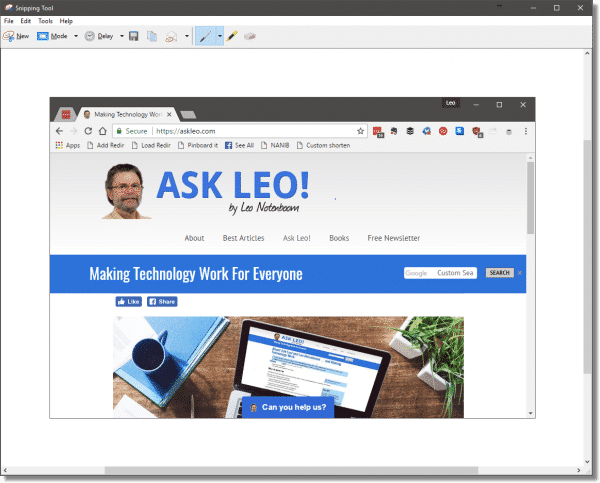 SnagIt – Quick and Easy Screen Capture and Annotation - Windows includes screen capture by default, but if you use it often and rely on it alone, you don't know what you're missing. TAGS: bestof, print screen, Prt Scr, screen shot, The Best of Ask Leo! « Previous post: What are the Pros and Cons of Web-based Email Over Desktop Email? hey, i did everything you said to do in your article but once i open paint or photoshop, you can’t click the paste button which means that it didn’t work. i don’t know what i’m doing wrong? The most common problem I see is that PrntScrn sometimes is on a key with another fnction as well. Often in those cases you need to also press shift, Fn or FLock key to get it to work. Exactly what depends on exactly what keyboard you have. When I open “Accessories” I do not have a “Paint” selection in the box. You mention “or equivalent” but I don’t know what program that might be. Can you set me straight? I have Windows XP Home Edition. Thanks. There are lots of image editing programs out there. PaintShop Pro, Gimp, Adobe Photo Shop, and many more. i use printkey2000,its good,and free. A great free program for doing screen captures is MWSnap from http://www.mirekw.com. It allows you to capture all or selected part of screen. You can then print it directly, save the picture to a file, or copy/paste it to your word processor or whatever. For best, easiest results, try Screenshot Captor from the Donation Coder Website (www.donationcoder.com). It has built in editing designed specially for screenshots and is registerware. it’s really a good article for biginners. this works in many conditions, but still some does not work. for example, if someone need tocapture a screenshot of streaming video or a series of screenshots. sometime a screen demo tells more, there are many tools there can make this, such as DemoBuilder(easy to use and powerful, but only have a 256 color depth output), DemoCreator (a fresh man in this field, but a really good potential competitor of demobuilder), Captivate (maybe the most powerful one, but costful and a little complicated for biginners), Camtasia (powerful, but takes too much system resource). I found you by way of a Google search. I have not been able to do a screen shot since I got my wireless keyboard. I was hoping to find an answer here. I used to be able to do it the way you explained. Such a basic function, and so easy to forget. Thanks for making it so easy to do, and for including so many details. I used Adobe PhotoShop to paste my screen shot into and got a perfect image. I was also able to paste it into a MS Photo Editor easily, but just as PhotoShop has easier to use functions in every other regard (like cropping, a basic), it is also easier for pasting a screen shot, since it automatically creates the canvas size in the same dimensions as the image. I have no idea how MS Photo Editor decides what size to make the canvas, but it is inconvenient if one does not know the exact size of the image to be pasted. Anyway, thanks, Leo, for making this an easy task. PrtScn command is easy enough, but how about if you’re working on a program that works in DOS and covers the whole display? I PrtScn the display; hit the Windows key on the keyboard to go back to MsPaint, I hit ‘Ctrl+V’ and nothing happens, because there is nothing captured in the clipboard. Do you have a solution to this? Thanks by now. switch them into Windows mode where your printscreen will work just fine. Doesn’t work for all, but does work for many. Works great, saves MUCH time!!! How do i place a screen shot on a Forum???? forum documenation to see how to upload pictures. Ahhhh…screen shots…so easy once you have someone like Leo to help! Thanks sooo much! I tried all the tips above to make a screen shot. When I click on print or PrtSc all I get is a choice of printing it or exporting to MS Excel. I can’t even find a clipboard. I have use Microsoft Vista Home Premium, and IE7. Thanks Tye for the F-lock reminder. I was having the world of trouble but fogot about that little detail! Thank you Leo, I think that the information that you provide on your site is very informative and helpful. I just wanted to say thank you and keep up the great work. Another way to save a screen shot… open a Word window. After pressing “Print Screen”, go to your Word window and press Control-V and ta-da, your image appears there. The nice thing about this is you can then “re-size it by clicking on the image and extending the boarders. I often use this when the print in something is too small to see or if there is something too small to see clearly in an image. I can make it larger (not more clear, sadly) and more easy to decipher! The Windows 7 Snipping Tool is a nice included update of the PrintScreen method. Thanks, Leo, I learned something new today! I didn’t have a clue that any of this existed! I did what you said, and it worked like a charm. I’ll be bookmarking this page so I can refer to it when I need it in the future. Thanks again! An easy alternative is the Windows Snipping Tool. Easy to download and set up a shortcut key to invoke the program. Click-drag a rectangle anywhere on the screen and either save it as jpg or paste it into a document. Great for cleanly copying or saving any image from the screen. I tried Snagit and loved it, but they want too much for it. I have used Snipit, but I also have PrintKeyPro. On Macs: For screen shot don’t you just press command, shift and 4? There are just so many free screen captures out there. Almost all seem to work very well, so it must be an easy thing to do. I myself just usually use ScreenHunter. While not saying that this is necessarily the best, it certainly fulfills all my needs, quickly and easily. As to PrtSc it is cumbersome and a waste of time, not to mention no options. I’ve been using the PrtSc/mspaint method for so long, I didn’t realize that Microsoft had added a new tool for this purpose. Thank you for the tip. Actually I checked when I wrote the article because I wasn’t sure either. It’s in my copy of Vista. Best tip I’ve had for a long time, Cheers Leo! My favorite (free) screen capture program is MWSnap. So easy to use and the picture you capture can be saved, printed, or copied and pasted into a document. I use it all the time for preparing project submittal drawings. Works great for crafting projects as well. I use IMTOOLPACK it’s free and will grab whatever portion you desire and allow you to print/save. I use a powerful free (donationware) program called ScreenShotCaptor. It runs when you press PrintScreen and allows you to edit and annotate the screen before saving it or placing it in the clipboard. I don’t know it it’s as good as SnagIt, but it does the job for me. I use screenprint32 in XP. It allows pretty much the same features as Snipping in 7 and activates from the printscreen button or any other key you select in the options. In snipping you can’t use a shortcut key and is a hassle to go to programs or Start Menu for a quick capture. I have placed Snipping in the launch bar as a workaround for a shortcut. I have been using PrtScr in 7 and it defaults to the printscreen button as a shortcut. However you have use the control key to drag a rectangle. Wish I could meld all of them together. I will give SnagIt a try. Appreciate being made aware of it. Try out IrfanView – it’s the simplest way to capture an image & add text to it. Love, love, love Snag It. From training documents to simple emails, it helps me tremendously both in the office and at home. The license even allows personal use for both a home and work PC. Highly recommended. If you need to send information about a problem you’re having, you can use the Problem Steps Recorder in Windows 7 and Windows 8. Type psr.exe in your search box and it will open the Problem Steps Recorder. Click Start Record at the top. Then you just do whatever you are having a problem with. It records every click you make as well as taking screen shots. When you’re finished, click Stop Record. You can then save the file or email it directly from the program. I use the screen shot as a backup. I use screen shot to copy/paste my desktop, my add/remove programs, my program files, and I also go to start/programs and use screen shot to copy/paste all the programs that are on the desktop. I copy all of these in a backup folder with a word document in case I need to do a wipe and reinstall the operating system. PicPick is a great, free graphics tool available from http://www.picpick.org/en/. I’ve kept it handy for years. It’s a TSR you can load at Windows startup, so it’s always at the ready. Or, START>ALL PGMS>ACCESSORIES>WORDPAD (not “Notepad”) then right-click and “Paste” at the cursor. About Print Screen… On Windows 7 we always hit the FN button plus PRTSC button to capture the image. Then we open a Word document and hit Control-V to print the screen to a Word document where we can name and save it. Makes it easy to send it out in emails! The one thing that annoys me about the Snipping Tool – tho’ I love it otherwise – is that I can’t paste directly into my AOL e-mail Compose page! Seems I have to paste it into Word, then make an attachment of the Word doc to send it to anyone. Any ideas, anyone, for an easier way? Hmm…the copy & paste with snipping tool method works fine with Office Outlook email in Win 7. Can also drag the handles of the image to resize it in the email. I have looked for this on the web, see quite a few ‘How-to’s’..but have yet to find one that actually works. When using a Mac USB keyboard (used explicity because of touch preference by someone that types..FAST… for a living) on an XP machine..is there a key sequence that accomplishes a Windows ‘Prt Scrn’ function? I use Mwsnap which works good for me. With it you can frame what you want. Or do a full screen. Here’s an article from Leo about what software he uses. One is a very cool tool that allows you to capture key-sequences and turn them into hot keys. An existing key sequence would be needed..no re-map program, script or other tool. The machine mentioned is on a secure network that will not allow users to ‘run’ anything. Incidentally, I have found that Snipping Tool (Windows 8) will allow you to save an image when right-clicking on the picture and selecting “Save picture as…” won’t. If you find it cumbersome going through all those steps to get to the Windows Snipping Tool, there are a couple of ways of creating shortcuts to make it easier. 2. Right click on the Snipping Tool under Accessories (or the Windows 8 tile menu after typing snip) and choose Pin to Task Bar. Another life saver for helping someone with a computer issue is Skype screen share. If you can connect up with Skype you can both talk and see what’s going on with their screen as it happens. In Windows 8 hitting windows key + print scrn puts a dot png copy of the screen into a folder in your pictures library. Maybe this is off the subject. Is there a way to print something that is more than one screen full? I was trying to capture something that was spread across several screens. I just kept moving down the page taking screen shots. Kind of crude. Maybe that is a subject for another day. I think Leo mentioned it in his recommendation of SnagIt. He said it will capture a scrolling window. Correct me if I’m wrong Leo (because I’ve never used it), but that says to me that I could use SnagIt to get a screen capture of this entire Firefox window from the question at the top to the last comment at the bottom and it would all be in one image file. Utilities like SnagIt can do scrolling screen shots. Softoria Capture works well for me, both on XP and 7. It’s free, and after I’ve finished with it, I can exit the program, while leaving it available. The one I use is WinSnap: version 1 is still available and free, and has a variety of colouring and shadowing options. One of my browsers, Fastpeak SlimBrowser, has screenshot commands built-in to the File menu. I also often use PrtScrn with Paint; I have read that Alt + PrtScrn only copies the working area of the window, but in my experience the whole window is copied whether or not Alt, Shift or Ctrl are pressed. Use screen captures for removing all possible EXIF data from photos. You can also use Microsoft Word for screenshots. Open Word, click Insert, click the Screenshot option and choose from the list of shots in the pop up or click Screen Clipping to clip exactly what you want. For the screen clipping, first minimize all your windows except the one you want to clip, then go to Word as described above and select the Screen Clipping option. The screen will dim and allow you to clip the section you need, and it will appear in your Word document. I suppose there are lots of different ways to do this. Personally, I often use the OneNote screen clip utility [hold down windows key and press s if you have OneNote running in the background]. Then copy it into one note and you can send it as a PDF attachment. You can also do annotations using the insert menu. There is no way to print iTunes receipts out of your purchase history. You often receive receipts in your email, but they come one at a time, and as I have dozens of purchases I need to submit to my administration for reimbursement, one-at-a-time seemed ridiculous, and Apple is not faithful about sending a receipt email every time either. The Snipping tool– making a screenshot and copying it into a word document–perfect. Thanks! I use Windows 7 and still prefer Print Screen and Alt+Print Screen. Maybe because it’s ingrained in me since Windows 3.1 or maybe because I don’t see the need of using another program to do something that is natively built into Windows. Of course I understand some people might not remember the key combination and so having a program might be helpful to those people. If I remember correctly, there used to be a key combination you could press when you got a dialog box with an error message. You could then paste the error message into an email or a text or Word document, instead of having to type out the error message, if you were asking for help. I don’t remember what the key combination is. I wonder if it still works? Re: Screenshot?? Is there a way in Windows 7 to get back a snapshot/prtScr from your clipboard AFTER you have right clicked on something else and copied?? I had 2 pop up boxes save in print screen and I went into my email after that and copied an email and lost the first print screen on my clipboard HELP PLEASE I need the first file back?? You’d have to install a third party clipboard manager to save previous copies of your clipboard. I use Ditto which is free and does a pretty good job. It’s also available from the Microsoft Store. No. The prior contents of the clipboard are discarded when you copy something else into it. 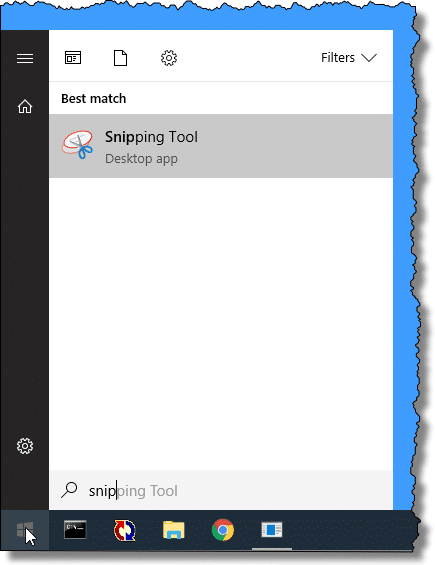 My W10 does not have a “snipping tool”. There should be a snipping tool. Never heard of cloud shot. It may be erased because it has nothing to do with this article, but because some images are http, you will get a warning that “This page is not safe”. When using Windows 10 to capture a screen shot, press the Windows Key + PrtScr for the screen shot. Adding the Windows Key to the sequence will store the screen shot in a folder named Screenshot in the Pictures folder. Thank you for sharing about screenshot methods other than PrtSc. Through this episode, I learned about Alt-PrtSc and the Snip tool. Hi sir, can I take a kind help me about screen shot ? How I can send it to you to take support me? The article you’re commenting on tells you how to take a screen shot. AFTER you’ve submitted a question via https://askleo.com/ask we can make arrangements to get a screen shot to me if needed.